p.s. Get an additional 25% off all sale items at Shopbop using code SALE25! Last week's heat wave was killer. Walking the six blocks from the subway to my apartment was dreadful. I showered in the morning, right before work, and I was a sweaty mess by the time I got to the office. However, the highlight of my heat wave experience was getting stuck in an elevator as I was leaving a work dinner on Thursday night. Want to know why that was the highlight of the week? Well, the elevator shut down completely and along with it went the A/C. There was no ventilation in there so my coworker and I were literally dripping (sorry for the visual) for twenty minutes until we were finally let out. I'm not even sure where I'm going with this story but I do know that these pictures were snapped three hours prior to the aforementioned elevator debacle. I'm clearly thinking that a few rain drops would have been nice. 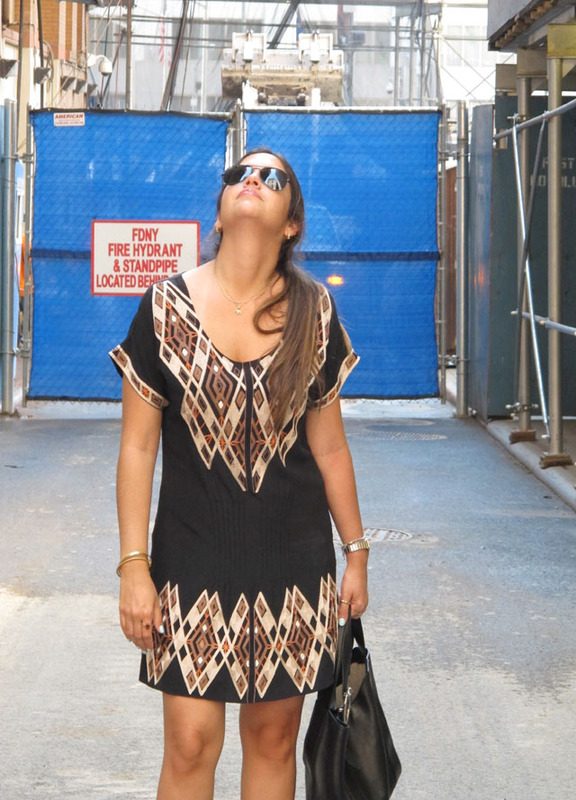 This dress is so cool–I love the tribal feel of it! I love the print on this dress! Your sandals are gorg too! O gosh that elevator debacle sounds horrible! But at least you looked good right? Love the dress! Look gorgeous in your pictures. I would have actually died in that elevator. I'm talking full on panic attack. I'm glad you are safe though! Work this dress, girl! I'm glad you escaped from the elevator of doom and have been reunited with your shower and a/c!